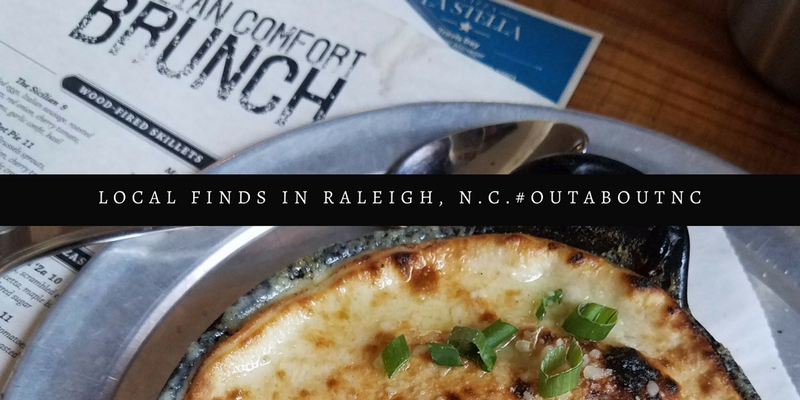 Hines-Sight Blog: #OutaboutNC: Pizza Pot Pie for Brunch in Raleigh, Oh My! #OutaboutNC: Pizza Pot Pie for Brunch in Raleigh, Oh My! When you visit a city, it may be your tradition to have brunch before you head home. 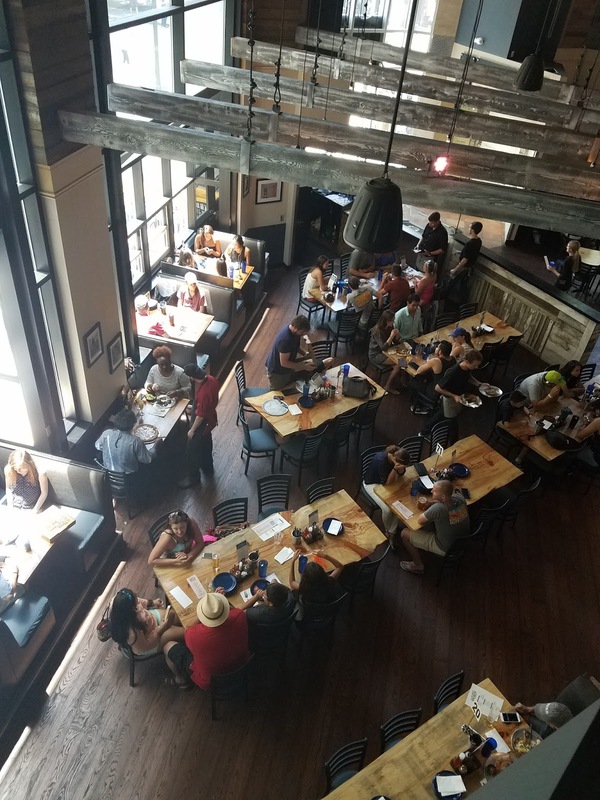 Raleigh has no shortage of places to brunch. We are certainly a foodie city, and you can point yourself in about any direction and find a good place to eat. As a Raleigh local, I don't partake in brunch too often on the weekends unless I'm traveling. I blame it on being a parent. I'm sure there are other excuses as well such as not wanting to get out of my pajamas before noon. But, let's just say that when I brunch, it better be worth my getting dressed and out of the house. A delicious Bloody Mary needs to be involved, too. The Hines recently visited Pizza La Stella at their invitation on Fayetteville Street for brunch. This local, Neapolitan style Italian restaurant, under new management, recently partnered with NC company Smash Waffle to serve a weekend brunch. After we visited, Smash Waffle announced it is also opening its own triangle location. 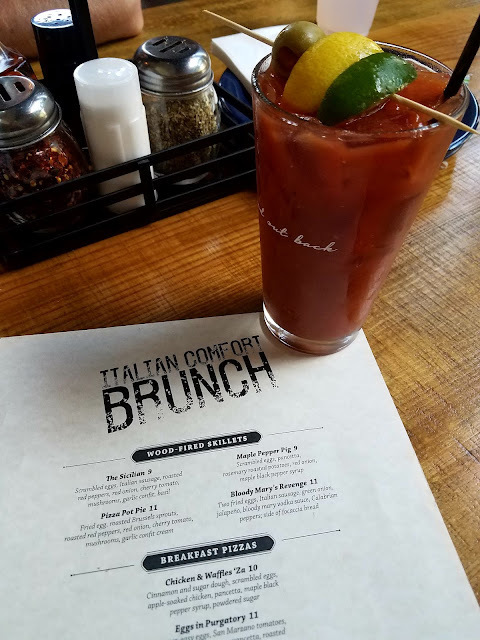 I'm not sure if that move will change the partnership in the future for Pizza La Stella's brunch menu, but for now, it's a staple on this local Raleigh restaurant's menu. We live less than ten minutes from the heart of downtown Raleigh and this restaurant. On the day I decided to do a rare family brunch, half the streets in downtown were closed for the Ironman Race. It took us almost 25 minutes to get where we needed to be. We had to park block and blocks from where we were going. That won't happen to you on an ordinary Raleigh day. I had one child complaining that she had to walk too far to get where we were going. I had another child asking why I made him change clothes. And then there was Will who said absolutely nothing except I was not helping him find streets that were open to traffic. Let's just say that a lot was riding on this brunch at Pizza La Stella, or I would be in the doghouse for getting my family out of the house before noon on one of the hardest days to travel to downtown Raleigh for a meal. Long story short, Pizza La Stella took me from the dog house to the title of the Queen of Brunch on this day. 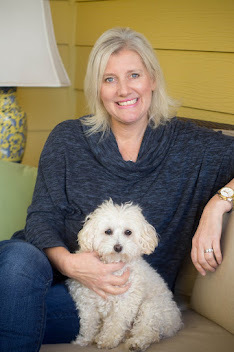 This face. 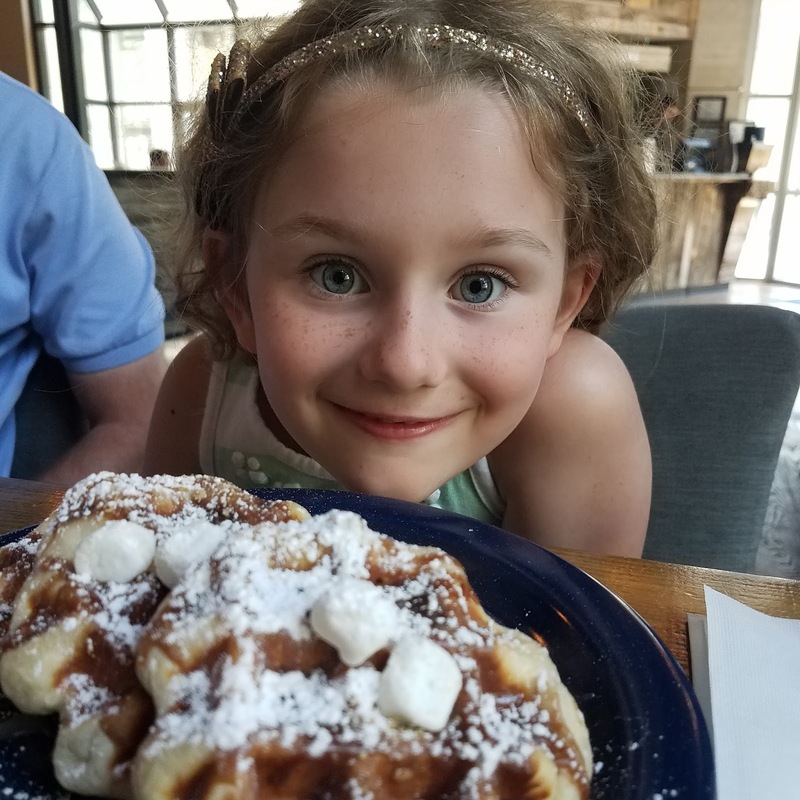 That's what it looks like when a Campfire Smash Waffle is placed in front of her. Jack ordered the Chip, Chip Hooray Smash Waffle. 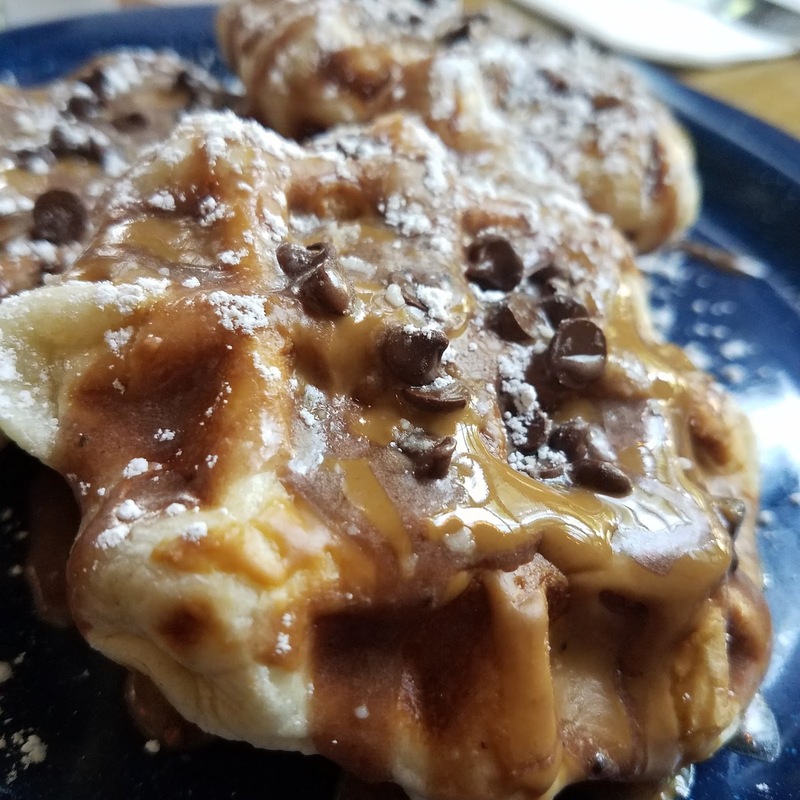 The kids loved these waffles, but they could not finish them. They were adult portions and really sweet. 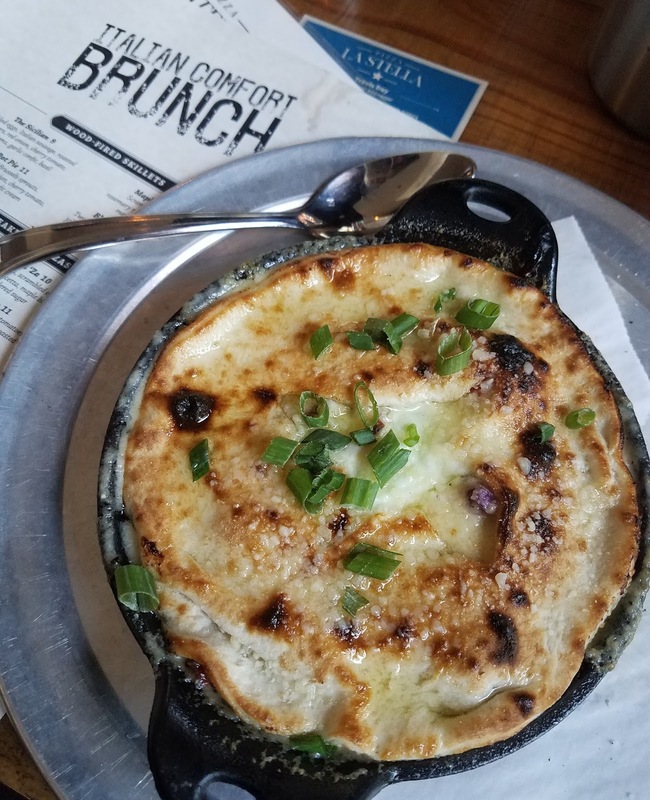 As for me, I ordered the Pizza Pot Pie which is a wood-fired skillet with a fried egg, roasted Brussel sprouts, roasted red pepper, red onion, cherry tomatoes, and mushrooms in a garlic, confit cream. It was one of the best dishes I have tasted in a very long time. I cannot rave enough about this dish. I will go to brunch again there just for this entree. It is dish created by the restaurant's own culinary team. Will chose to order the calzone which is also served at night. He was impressed. It's not as puffy as other ones. He would get this again. I will definitely add Pizza La Stella to my list of local favorites. I'll probably visit more at night, but I was quite impressed. Oh, and those Bloody Marys? So good. I had two. Pizza La Stella opened in December 2016 and replaced Bolt Bistro. The menu at Pizza La Stella is about wood-fired cuisine. Two large ovens, handmade in Italy, are the only warming devices in the kitchen to cook pizzas, wings, stromboli, calzones and even Brussels sprouts. In the pizza oven, pies will be cooked at about 1,000 degrees and ready in about 90 seconds. Everything else will get crispy in the other oven, which is set around 750 degrees. My kids liked the Smash Waffles a lot, but I think the wood-fired specialties and breakfast pizzas are the true gems. That is why I will go back. That Pizza Pot Pie was delicious. The Aloft on Hillsborough Street is 2.3 miles away. 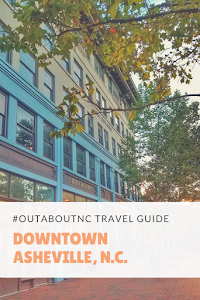 And many more places to stay in Raleigh and Wake County. 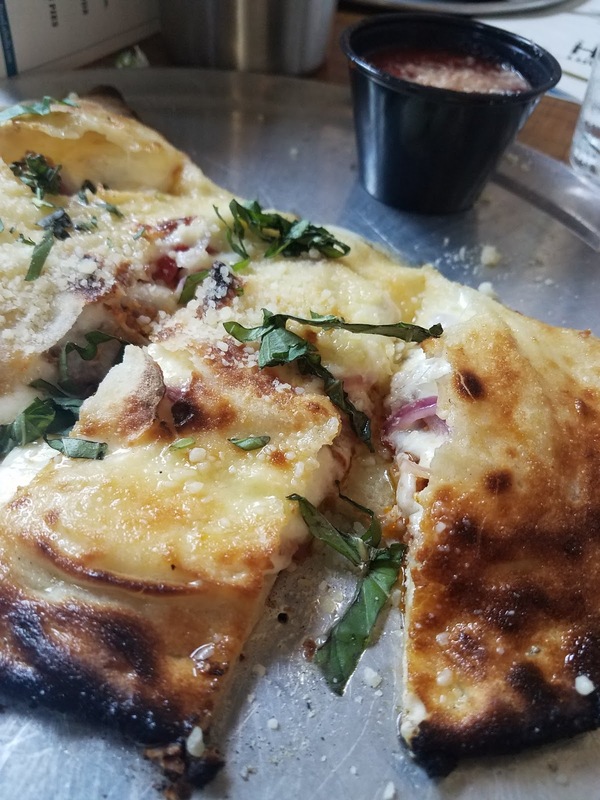 Disclosure: We were media guests of Pizza La Stella, opinions are my own and I do not classify myself as a brunch expert, but the Pizza Pot Pie....go for it. If you book a hotel stay using my referral links, a small commission will be made. 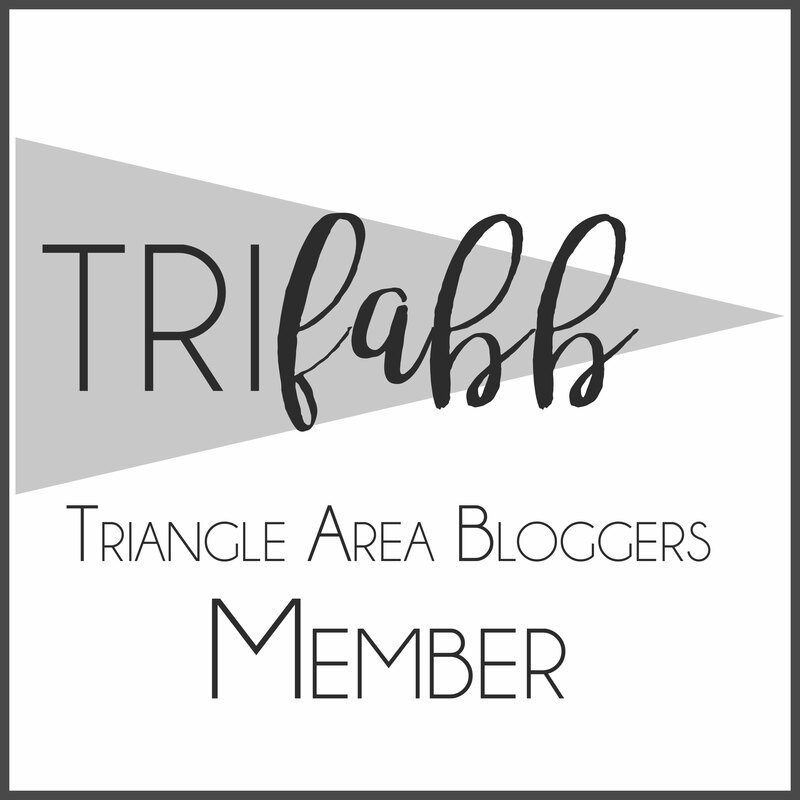 Thank you for booking through this blog and supporting editorial/media writing.